A refillable, magnetic compact for creamy foundations. Select a light, medium or dark duo combination in warm, neutral or cool undertones. Your perfect all-year-round Duo – use the lighter shades for pale winter tones and the darker shade for the tanned summer skin. Blend to perfection, especially in between season. 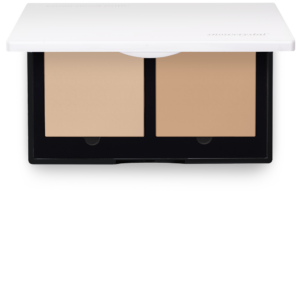 Or use light colour to highlight or conceal and darkest shades for contouring. Multi-use, customizable compacts that can be filled, refilled and reused, keeping your cosmetics collection upto date all the time.